We are told, first of all, that the Lord listens to the poor who cry to Him and is good to those who seek refuge in him, their hearts broken by sadness, loneliness and exclusion. The Lord listens to those who are downtrodden in their dignity and yet have the strength to look up in order to receive light and comfort. He listens to those who are persecuted in the name of a false justice, oppressed by policies unworthy of the name and intimidated by violence. And yet they know that they have their Saviour in God. What emerges from this prayer is above all the sense of abandonment to, and trust in, a Father who listens and is welcoming. It is on the same wavelength as these words that we can better understand what Jesus proclaimed with the beatitude “Blessed are the poor in spirit, for theirs is the kingdom of heaven” (Matthew 5:3). Such is this unique experience, in many ways undeserved and impossible to express in full, that we nevertheless feel the desire to communicate it to others, first of all to those who, like the Psalmist, are poor, rejected and marginalized. In fact, no one can feel excluded from the Father’s love, especially in a world which often elevates riches as the primary objective and leads us to isolation. What we need in order to recognise their voice is silence in which to listen. If we speak too much ourselves, we will be unable to hear them. Often I am afraid that many initiatives, by themselves meritorious and necessary, are intended more to please those who undertake them than to really acknowledge the cry of the poor. If this is the case, when the cry of the poor rings out, our reaction is incoherent and we are unable to empathize with their condition. We are so entrapped in a culture which obliges us to look in the mirror and to pamper ourselves that we believe that a gesture of altruism is sufficient without compromising ourselves directly. 3. The second verb is “to answer”. The Lord, the Psalmist tells us, not only listens to the cry of the poor, but He answers it. His answer, as attested by the whole history of salvation, is an all-loving sharing in the condition of the poor. It was so when Abram expressed to God his desire for an offspring, notwithstanding that he and his wife Sarah were old in years and had no children (cf. Genesis 15:1-6). It happened when Moses, through a bush which burned without being consumed, received the revelation of the divine name and the mission to free his people from Egypt (Exodus 3:1-15). And this answer is confirmed throughout the wandering of Israel in the desert, when it was bitten by hunger and thirst (cf. Exodus 16:1-6; 17:1-7) and when it fell into wretchedness of the worst kind, that is, unfaithfulness to the covenant and idolatry (cf. Exodus 32:1-14). God’s answer to the poor is always an intervention of salvation in order to heal the wounds of body and soul, restore justice and assist in beginning anew to live life with dignity. God’s answer is also an appeal in order that those who believe in Him can do the same within the limitations of their human nature. The World Day of the Poor wishes to be a small answer which the whole Church, spread throughout the world, gives to the poor of every type and in every land lest they think that their cry has gone unheard. Probably, it is like a drop of water in the desert of poverty; and yet it can be a sign of sharing for those who are in need, that they might experience the active presence of a brother or a sister. It is not delegated power of which the poor have need, but the personal involvement of as many as hear their cry. 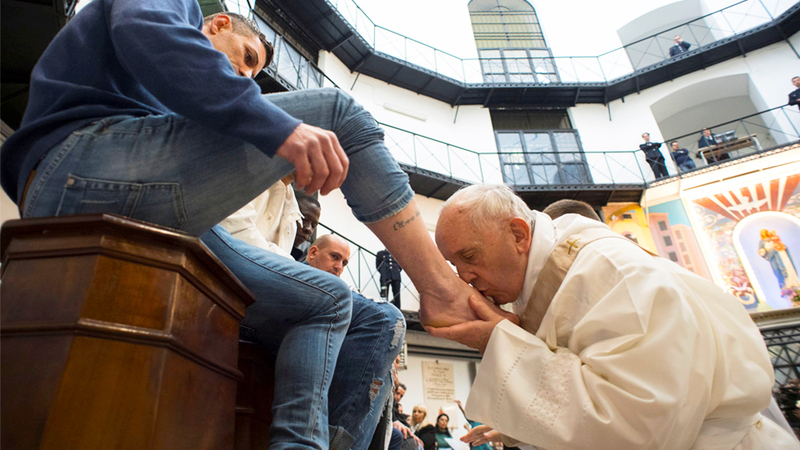 The concern of believers cannot be limited to a kind of assistance – as useful and as providential as this may be in the beginning – but requires a «loving attentiveness» (Apostolic Exhortation Evangelii gaudium, 199) which honours the person as such and seeks out his best interests. 4. The third verb is “to free”. The poor of the Bible live with the certainty that God intervenes in their favour to restore their dignity. Poverty is not brought on by itself, but is caused by selfishness, pride, greed and injustice. These are evils as old as man himself, but also sins in which the innocents are caught up, leading to consequences on the social level which are dramatic. God’s liberating action is an act of salvation towards those who manifest their sadness and distress to Him. The prison of poverty is broken open by the power of God’s intervention. Many of the Psalms narrate and celebrate this history of salvation which is mirrored in the personal life of the poor: «For he has not despised or abhorred the affliction of the afflicted; and he has not hidden his face from him, but has heard, when he cried to him» (Psalm 22:25). To be able to contemplate God’s countenance is a sign of His friendship, His proximity, and His salvation. «Thou hast seen my affliction, thou hast taken heed of my adversities ... thou hast set my feet in a broad place» (Psalm 31:8-9). To offer the poor a “broad space” is to liberate them from the “snare of the fowler” (Psalm 91:3) and subtract them from the trap hidden on their path, in order that they might proceed expeditiously and look serenely upon life. God’s salvation takes the form of a hand held out to the poor which is welcoming, offers protection and allows them to experience the friendship which they need. It is beginning with this concrete and tangible proximity that a genuine path of liberation emerges. «Each individual Christian and every community is called to be an instrument of God for the liberation and promotion of the poor, and for enabling them to be fully a part of society. This demands that we be docile and attentive to the cry of the poor and to come to their aid» (Evangelii gaudium, 187). 5. I find it moving to know that many of the poor have identified themselves with Bartimaeus from St. Mark’s Gospel. Bartimaeus, a blind man, «was sitting by the roadside to beg» (verse 46) and, having heard that Jesus was passing by, «began to cry out and say, “Jesus, Son of David, have mercy on me”» (verse 47). «Many rebuked him, telling him to be silent; but he cried out all the more» (verse 48). The Son of God heard his cry: «“What do you want me to do for you?” And the blind man said to him, “Master, let me receive my sight”» (verse 51). This Gospel narrative makes visible what in the Psalm is announced as a promise. Bartimaeus is a poor man who finds himself deprived of fundamental capacities like his sight and being able to work for his living. How many paths today also lead to forms of precariousness! The lack of basic means of subsistence, marginalization stemming from a reduced capacity to work owing to ill-heath, the various forms of social slavery, notwithstanding the progress made by humankind ... How many poor people today are like Bartimaeus, sitting by the roadside and searching for the meaning of their existence! How many of them ask themselves why they have fallen so far and how they can escape! They are waiting from someone to come up and say: «Take heart; rise, he is calling you» (verse 49). Unfortunately, often the opposite happens and the poor are reached by voices rebuking them and telling them to shut up and to put up. These voices are out of tune, often determined by a phobia of the poor, considered not only as destitute, but also as bearers of insecurity and instability, detached from the habits of daily life and, consequently, to be rejected and kept afar. The tendency is to create a distance between them and us, without realizing that by so doing we distance ourselves from the Lord Jesus who does not reject the poor, but calls them to Him and consoles them. The words of the Prophet concerning the style of life proper to believers is most apt in this case: «to loose the bonds of wickedness, to undo the thongs of the yoke, to let the oppressed go free and to break every yoke ... to share bread with the hungry and bring the homeless and poor into the house ... to cover the naked» (Isaiah 58:6-7). Deeds such as these allow sin to be forgiven (cf. 1 Peter 4:8), justice to pursue its path and, when it is us to cry to the Lord, ensure that he will answer and say: here I am! (Isaiah 58:9). On this World Day we are invited to give concreteness to the words of the Psalm: «The afflicted shall eat and be satisfied» (Psalm 22:27). We know that in the Temple of Jerusalem, after the sacrificial rite, a banquet took place. It was this experience which enriched the first World Day of the Poor in many Dioceses last year. Many people found the warmth of a home, the joy of a celebration meal and the solidarity of those who wished to share the table in a simple and brotherly way. I would like that this year and in the future this World Day be celebrated in the spirit of joy for the rediscovery of our capacity for getting together. Praying together as a community and sharing a Sunday meal is an experience which takes us back to the earliest Christian community, described by St. Luke the Evangelist with all his originality and simplicity: «And they devoted themselves to the apostles’ teaching and fellowship, to the breaking of bread and the prayers. [...] And all who believed were together and had all things in common; and they sold their possessions and goods and distributed them to all, as any had need» (Acts 2:42.44-45). 7. Numerous initiatives are undertaken every day by the Christian community in order to give a sign of neighbourliness and relief in the face of the many forms of poverty which are before our eyes. Often it is the case that cooperation with other enterprises, moved not not by faith but by human solidarity, enable us to give assistance which by ourselves would have been impossible. Recognising that in the immense world of poverty our capacity for action is limited, weak and insufficient leads us to reach out to others so that reciprocal cooperation can reach its objective in a more effective way. We are inspired by faith and by the imperative of charity, but we also know how to recognise other forms of assistance and solidarity which are characterized, in part, by our same objectives, albeit that we do not neglect our proper role which is to lead everyone to God and to holiness. Dialogue among the different forms of experience and humility in giving freely of our collaboration, without seeking the limelight, is an adequate and fully evangelical response which we can all give. 9. A word of hope is the natural epilogue to which faith gives rise. Often it is the poor who undermine our indifference which is the daughter of a vision of life which is too imminent and bound up with the present. The cry of the poor is also a cry of hope which manifests the certainty of being liberated. This hope is founded upon the love of God who does not abandon those who trust in Him (cf. Romans 8:31-39). As St. Teresa of Ávila writes in The Way of Perfection: «Poverty comprises many virtues. It is a vast domain. I affirm that whoever despises all earthly goods holds dominion over them» (2:5). It is in the measure in which we are able to discern authentic good that we become rich before God and wise in the face of ourselves and others. It is really so: in the measure in which we succeed in giving riches their right and true sense that we grow in humanity and become capable of sharing. and the Lord heard him.